Hobbayne, Northfields and Elthorne are top wards for recycling in the borough and Acton and Southall Green come out at the bottom according to a new survey. Ealing Council revealed the results at the launch of an incentive scheme which will see the borough's 23 wards competing for extra cash. A total of £80,000 has been allocated and the council says is the first competition of its kind in the capital. The council survey revealed that currently 75% of people in Hobbayne, 71.9% in Northfields and 70.8% in Elthorne use their green boxes and white sacks compared to 47.1% in Acton Central, 46.5% in South Acton and 38.3% in Southall Green. “We all know recycling is so important and we want to show our support for those who take the effort by rewarding those communities with money for projects. There'll be a prize for the three best improved alongside the best overall, so everyone has a chance of winning." 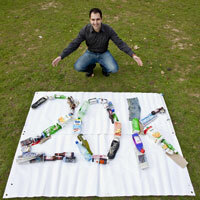 The weight of recycling will not be measured and the council will not be putting electronic chips in bins.